Now celebrating its 20th year, Epcot’s International Food & Wine Festival has many long-time fan favorite foods, but also prides itself on bringing new taste experiences each fall. Sometimes this is done with the creation of new booths and other times it is a matter of replacing items at booths from year to year. This year, there are multiple new booths and more than a dozen new items at booths brought back from previous years. Here are some of the new items and one of the new booths that you can find this year. At the Chew Lab, innovative cooking techniques are combined with flavorful ingredients to create works of art in the form of food. Chew Lab has three food items on its menu: Olive oil-poached salmon with fresh corn, bacon, and pepper jam; New York strip with parsnip silk, balsamic glaze, and arugula foam; and Liquid nitro chocolate-almond truffle with warm whiskey-caramel. No question, the food at this booth is some of the most beautifully plated foods that have ever been offered at Food and Wine. 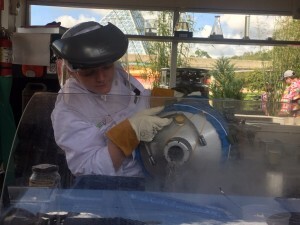 In addition, if you’ve never seen food prepared with liquid nitrogen before, watching the truffle being plated in front of you is almost as much of a treat as the truffle itself. On to the next item, the New York strip. In general, I am not a fan of foods with foams, so the New York strip started with an uphill battle for my approval. 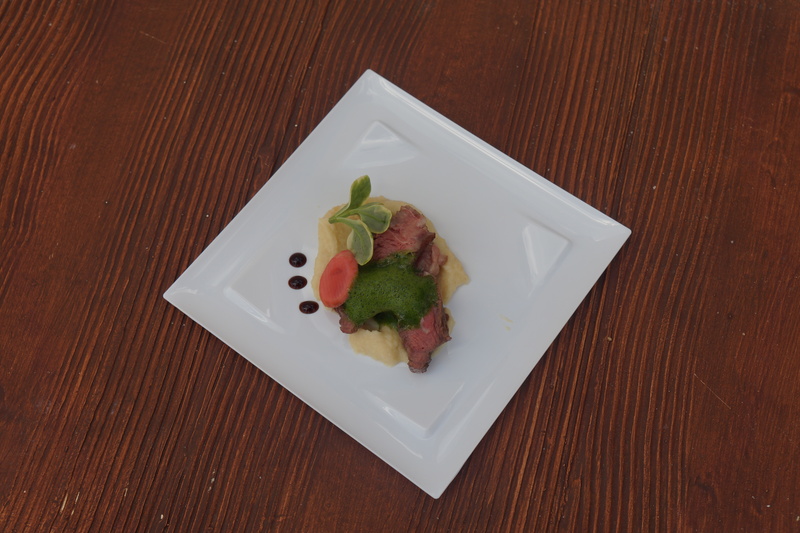 Making arugula into a foam was an intriguing idea, and it worked well with the dish to help cut some of the sweetness of the parsnip silk. Unfortunately, the two pieces of steak that I got were each half gristle, and so that made this dish one that I likely won’t repeat. And now the star of the show at the Chew Lab booth: liquid nitrogen. Essentially the chocolate truffle is a chocolate mousse made into a ball and then dipped into liquid nitrogen, which instantly freezes it. 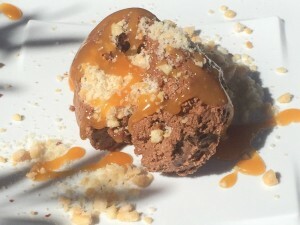 The frozen ball is then tapped with a small hammer to crack it open, and almond powder is sprinkled over the top and then it is coated with a whiskey-caramel sauce. Although the description says that the sauce is warm, when I was at the booth, the sauce had just arrived, so there was no time to warm it up. 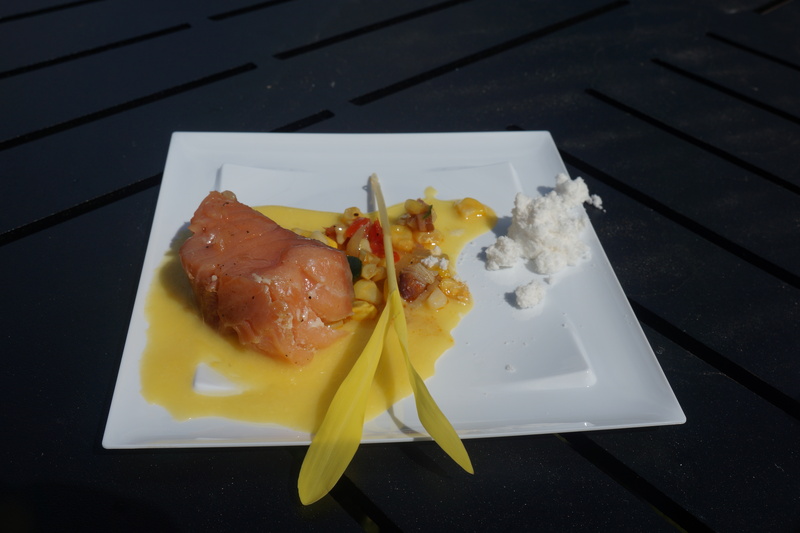 The flavor was very rich, but the texture was light. It is something I plan to get at least once more during the festival. When it comes to shrimp, one pet peeve of mine is shrimp that are not de-veined. Thankfully, the shrimp here are shelled down to the tail and de-veined. 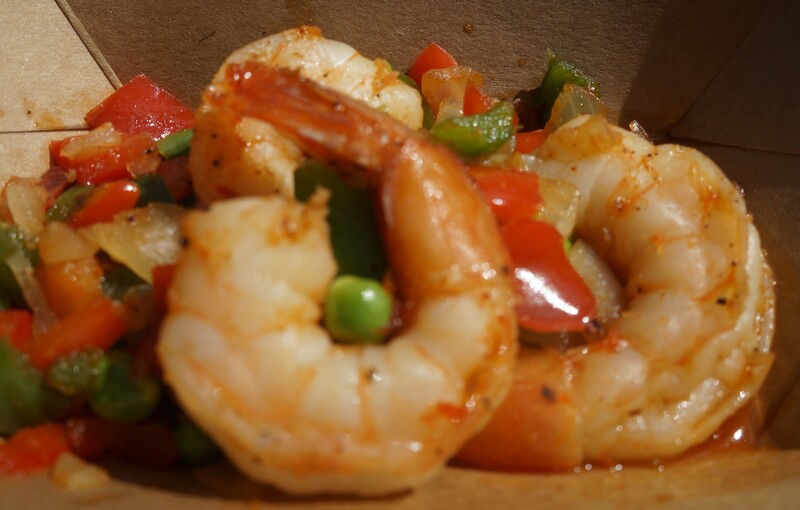 The shrimp were cooked perfectly, and were very flavorful. On the other hand, if there was pineapple in the dish as advertised, I couldn’t swear to it. What I got with my shrimp was a mixture of red and green peppers, a few bits of onion, and a couple peas. It is entirely possible that it just is how the vegetables were scooped out, however, and I would certainly be willing to try it again. I had extremely high hopes for the Lamington cake. Cake + chocolate + coconut is a recipe for yum in my book. The coconut was fantastic, the chocolate was wonderful, but the cake was painfully dry. Perhaps some Australian readers can chime in about whether this is the norm for this type of cake, but even the layer of chocolate on the outside wasn’t enough to soften up this cake to make it worth a repeat visit for me. Brazil was my favorite booth last year. There was nothing that they had that I didn’t want to come back for seconds. And while I was sad to see any item go, the meat pie is a worthy successor. 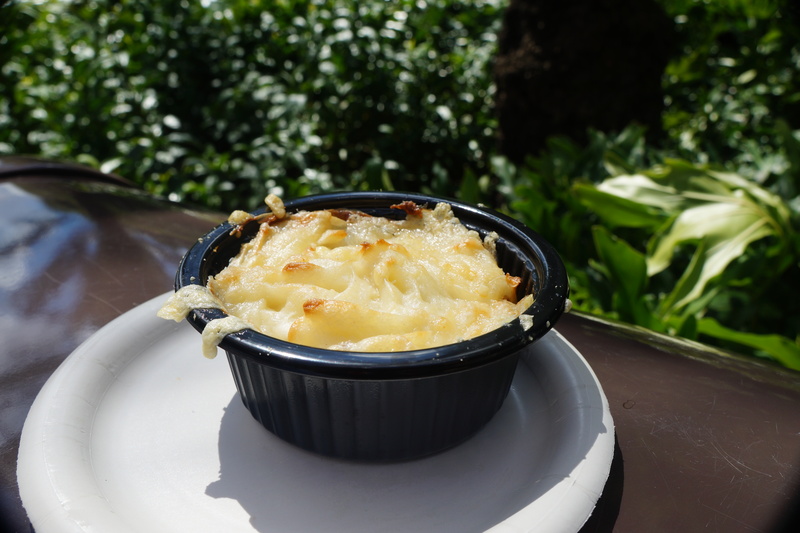 Essentially, this tastes like a shepherd’s pie, only without vegetables in with the meat and with mashed yucca on top instead of potatoes. Even though I was incredibly stuffed by the time I got to this booth, I wanted to polish off the entire dish. It was a wonderful blend of flavors–not spicy, but flavorful. Mine felt like it came right out of the oven before it was handed to me, and so the top of it was slightly crispy. Although I didn’t get any of the Brazilian cheese bread to go with it, I think that will be a lunch at some point for me in the future. I don’t know if it is necessarily better than the buttered chicken, but it is at least its equal. 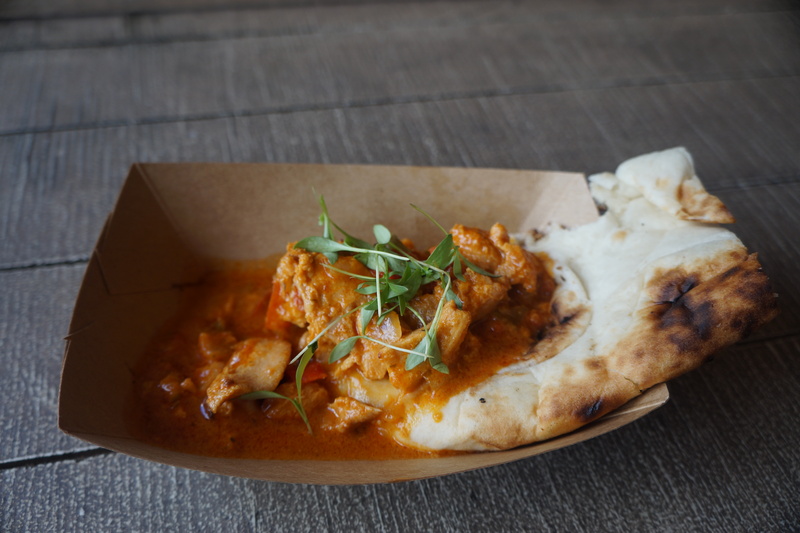 Stay tuned for more reviews of the new items at Epcot’s International Food and Wine Festival! Do any of these items make your mouth water? Have you had an opportunity to sample any of these, and if so, what are your thoughts? Let us know in the comments. 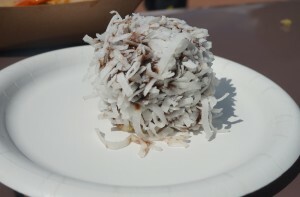 Actually, the Lamington isn’t new, but it’s been a few years since it’s been at the festival. And I too had high hopes for it when I first tried it years ago. I mean chocolate and coconut and cake? How could it go wrong? But it did. I too found the cake to be extremely dry. I was hopeful that I maybe just had a bad batch at the time, but I guess it would appear that’s not the case. I’m assuming all of these would quality as snacks on the DDP? My shrimp was overcooked, but I know this can vary with the serving just like some of the steak dishes. However, I thought the flavor wasn’t that good – there are better dishes to be had at the W&F. I also wasn’t overwhelmed by the truffle, it lacked a good chocolate flavor. However, it’s worth the purchase even if just for the presentation, and it’s not bad.